Weighty Matters: Big Milk farms out PhDs to do their dirty work. Big Milk's onslaught of advertisements designed to look like newspaper articles continued last week with this full page feature in Canwest papers. "While it may seem surprising, milk can even help people lose weight. 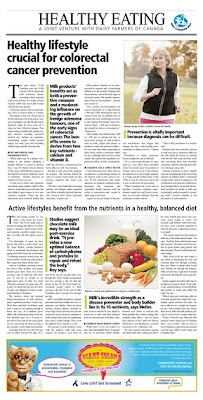 Studies report calcium rich diets can prove effective as a weight loss regime. Those studies have also shown diets rich in milk and milk products provide an extra boost to weight reduction." "the data available from randomized trials of dairy product or calcium supplementation provide little support for an effect in reducing body weight or fat mass." "until further research provides stronger, more conclusive evidence of an association between dairy consumption and weight loss"
That was in May 2007. Looking at Medline since May 2007 there has only been one study published that specifically looked at the effects of dairy consumption patterns on weight loss. That study's conclusion? "Our results do not support the hypothesis that a higher dairy consumption protects against weight gain and development of metabolic disturbances in a Dutch elderly population." So to summarize. Big Milk itself admitted to the Federal Trade Commission that to date the suggestion that dairy contributes to weight loss is preliminary at best - a point agreed upon by Dr. Susan Barr, and a point the vast majority of studies on dairy consumption and weight conclude is in fact false as they demonstrate no benefit, yet here we have an advertisement published in the Canadian Press that includes a statement by a misinformed professor that the industry itself knows isn't even remotely conclusively true. I guess if pressed they could state that, "he said it, not us". Like I said before, if you're a physician or a researcher and Big Milk comes a'knockin' don't answer the call and if you see an "article" about the benefits of Dairy that calls itself a "joint venture", remember it's just an advertisement and given Big Milk's track record in advertising, it should be read with tremendous skepticism.